October 20, 2017 – Jupiter’s moon Amalthea casts a shadow on the gas giant planet in this image captured by NASA’s Juno spacecraft. 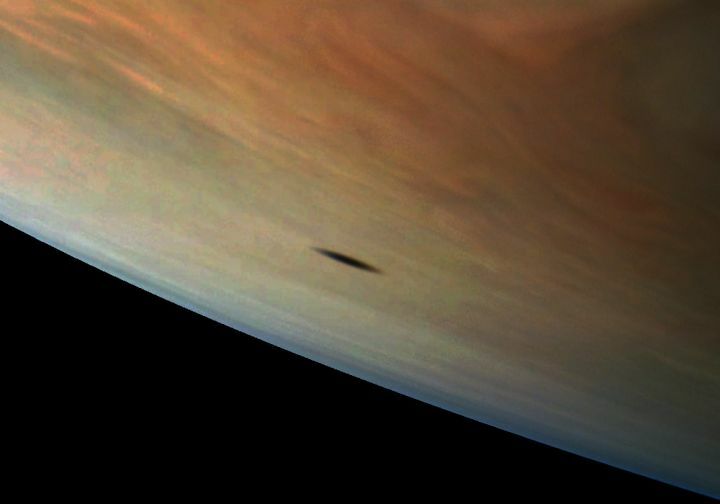 The elongated shape of the shadow is a result of both the location of the moon with relation to Jupiter in this image as well as the irregular shape of the moon itself. The image was taken on September 1, 2017 at 3:46 p.m. MDT (5:46 p.m. EDT), as Juno performed its eighth close flyby of Jupiter. At the time the image was taken, the spacecraft was 2,397 miles (3,858 kilometers) from the tops of the clouds of the planet at a latitude of 17.6 degrees.